These dogs are a cross between one or more sight hounds — such as the Greyhound, Whippet, Saluki, or Deerhound — and one or more pastoral working breeds, most popularly the Border Collie, or a terrier. Sometimes there is no pastoral blood at all, and they are then really ‘longdogs’ (a cross between two or more sight hounds), although all mixtures are popularly called Lurchers. They have been in this country for hundreds of years, from times when poor people were forbidden by law to own Greyhounds — so ‘Milord’s’ svelte hunting dog would have an illicit tryst with a scruffy farm dog, the results hiding their racy lines under a rough coat. The working dog added biddability to the sight hound, while the running dog supplied silence, speed, hunting ability, and a kind nature. Lurchers have come in from the cold since those days, and we common people can own them, even though some of them have sleek coats, which advertise clearly what they are. Because they are cross-breeds, and many have several breeds in their make-up, there is a size, colour, and coat type to suit everyone, though the shape is always the same. Nowadays, there are Lurcher events held all summer, where like-minded people can show their dogs, meet with fellow Lurcher owners, and take part in other activities, such as Lurcher racing, Lurcher obedience (which is totally different from Kennel Club obedience and so suitable for all types), and jumping competitions. The Lurcher’s original purpose was to put meat on the table for the common man, and though times have changed, these dogs have not: they are fast, furtive, intelligent, and quick to react. Although the Hunting Act of 2005 made many of their traditional tasks illegal, they are still widely used within the law for pest control of rabbits and rats. Any Lurcher you meet is likely to have been bred from working lines, and so retains the desire and capability to do his original job, whether you want him to or not. You have never seen true prey drive until you see a Lurcher in pursuit, so pet Lurcher owners must train really reliable recalls, and actively avoid situations where their dogs might get into trouble. These are hunting dogs and that is what they want to do, wherever they are. You cannot train it out of them, nor call them back once they have launched, so it’s all about avoiding situations where they would have the opportunity to course and catch. Always keep a good lookout for wildlife, and never be afraid to put the lead back on. Do not let your dog run free in woodland, as the risk of collision with trees or running onto a sharp fallen branch is too great. But they do need to run, so you have to find safe places for them to stretch their limbs and glory in their speed. They often like to run away from you for the sheer joy of running back, but they are nimble, so stand your ground when your Lurcher runs towards you, as most will jink around you at the last second, rather than uproot you. 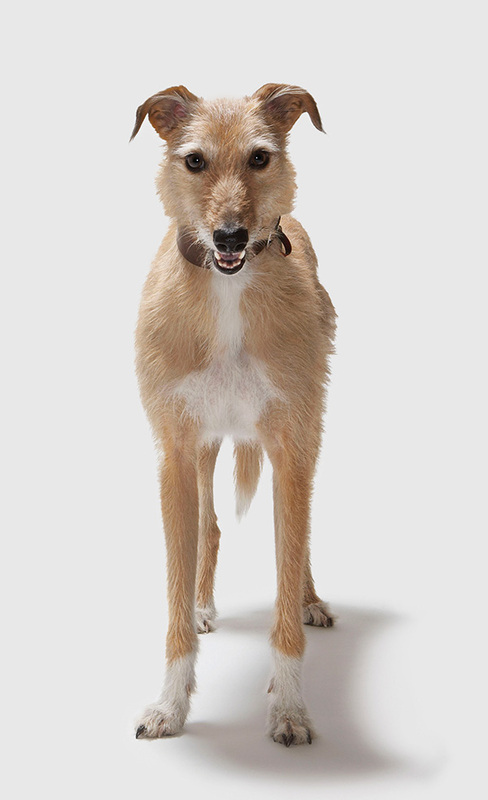 Their long bodies and legs mean they can stretch a long way, so Lurchers are great for teaching people to put food away and close doors. They are accomplished thieves and can use their long noses and paws to undo catches and bolts. While food they may steal is always desirable — and they can vacuum a cake off a table without breaking stride — they are fastidious eaters with their own food, and simply will not eat anything they don’t like. Those who claim dogs will not starve themselves never owned a Lurcher, especially one with a lot of Deerhound in him. They will also walk away from a partfilled food bowl once they have had enough, which owners of some breeds find astonishing. Lurchers often sleep very deeply with their eyes open, so be careful that nobody intrudes on them until you are certain they are awake. If taken to training classes, ensure that the instructor understands that the Lurcher’s long back and bony bum makes ‘Sit’ very uncomfortable, and his deep chest makes ‘Down’ equally unpleasant. Nor do Lurchers want to repeat exercises — they’ll do something once to be obliging, and after that, you can whistle Dixie. They find noise actively unpleasant, so echoing halls or barking dogs can stress them to the point of wanting to run away, or else they shut down completely. They are, however, very trainable if they trust you and can see the point of whatever you want them to do. Lurchers are generally healthy into old age, but their speed and enthusiasm for the chase can mean collision injuries, strains, and rips. Their tails are long and thin-skinned, so take care to see your dog is in a clear space before you let him run, and be very careful with doors in the house and car. Deep-chested dogs can be at risk of bloat, so leave as long as possible between feeding and exercise. Sight hound types have a higher red blood cell count than other dogs, and are also extremely sensitive to anaesthetics and sedatives, even the most modern ones, so it is important for veterinary staff to be aware of this. Vets who are Greyhound specialists are ideal for this type of dog. They are not antagonistic and would generally rather run than fight, so it’s the owner’s responsibility to deflect rude or boisterous dogs before a Lurcher bolts, as they can go a long way very quickly and possibly run into danger. A Lurcher with terrier in him may stand his ground, and it’s a foolish dog that then pushes his luck. Unless chasing something — in which case they would run through the gates of Hell — Lurchers are the most incredible wimps. Loud screams and trembling may accompany having trodden on a piece of grit or a small nettle, or the very idea that you might want them to walk through a puddle. They may insist they can’t possibly go out when it is raining (they can, I promise), or beseech you with huge eyes if you want them to walk somewhere where they once had a fright. They often sustain what I call ‘football injuries’, where a bit of sympathy and a rub of the affected area cures the pain. However, if badly injured, they can be so stoical that a novice owner might not realise that, this time, it really is serious. A good rule of thumb is that the louder the noise, the more trivial the injury — but always check first in case. Ideal home for a Lurcher: Calm, peaceful, cosy, with lots of comfortable furniture to sprawl upon. Are Lurchers good with other pets and people: People need to be polite and not try to force their attentions. These dogs are not recommended to keep with small furries, though most can be taught to accept poultry and their own cat. They dislike bouncy, bad-mannered dogs. Exercise requirements for a Lurcher: Ideally two daily walks of an hour each, which include some free running. Happy to go any distance if you’d like to do more. Trainability: Will work with you, rather than for you. Can be trained to a very high standard, as long as they can see the point and are adequately rewarded. Won’t tolerate endless repetition, loudness, or rough handling. Ideal activities for a Lurcher: Long country walks, Lurcher shows, Olympic-grade sleeping. 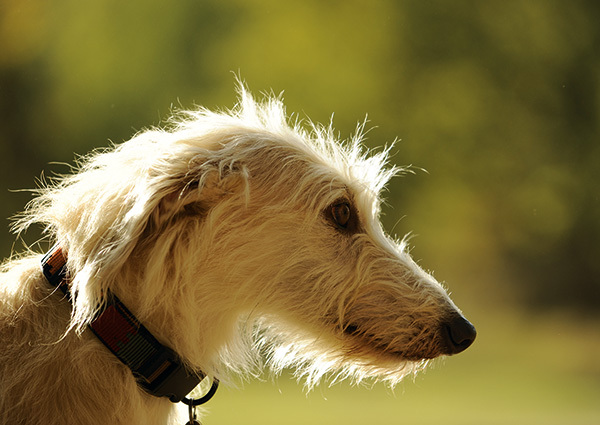 Can Lurchers be left alone? If introduced to the concept positively and gradually, and are well exercised beforehand.